There are stocks which you never get right - and where the facts and history is just so ambiguous that you don't think you will ever get them right. I am short. And I think now I have probably made a little money - but hardly enough to justify the stress I have gone through. And after all this time I am still far from sure what the underlying reality is. Australia has a long history in blood processing to provide antivenoms and technical blood products and has produced a global-giant product in this space - CSL. Dr Du was a Melbourne based Chinese heart and lung surgeon with good knowledge of this technology who moved to China to start a blood processing business which was by repute not very large, but modestly successful. It didn't end well for Dr Du. He was arrested and charged with embezzling a couple million yuan from the company (the accuser was his business partner) and the business was stripped from him. He spent six years in prison. You can find an abbreviated version of the story here. There is some evidence that these charges were trumped up. And they were not over a lot of money in the scheme of things. The amount of money was USD360 thousand. This is not how a giant and successful business usually changes hands. China Biologic Products came to market by the most suspect of methods - a reverse merger - at the height of the China reverse merger frauds. The material here looks really damming. Here is the first 10-K filing by the company as a Chinese company. On July 19, 2006, we completed a reverse acquisition with Logic Express, whereby we issued to the stockholders of Logic Express, 18,484,715 shares of our common stock in exchange for 100% of the issued and outstanding shares of capital stock of Logic Express and its majority- owned Chinese operating subsidiary, Shandong Taibang. As a result of the reverse acquisition, Logic Express became our 100% owned subsidiary and the former shareholders of Logic Express became our controlling shareholders with 96.1% of our common stock. Shandong Taibang became our 82.76%- owned indirect subsidiary and is the operating company for all of our commercial operations. Shandong Taibang, is a sino-foreign joint venture company established on October 23, 2002 with a registered capital of RMB80 million (approximately $10.3 million). Upon the closing of the reverse acquisition, Timothy P. Halter, our sole director prior to the reverse acquisition, submitted his resignation letter pursuant to which he resigned from all offices he held and from his position as our director, effective immediately. Siu Ling Chan and Lin Ling Li were appointed as our directors at the closing of the reverse acquisition. In addition, our executive officer was replaced by the Logic Express executive officers named herein at the closing of the reverse acquisition. There is a fair bit to unpack here. The listing was a standard enough reverse merger into Shepherd Food Equipment Acquisition Corp. You would like to find something out about them but they were an utterly delinquent filer. SEC filings don't exist. And the core business wasn't China Biologic Products (that name came later). It was Shandong Taibang. Moreover they only owned after the merger 82.76 percent of it. The other 17.24 percent was owned by an undisclosed party. That party will be explored later in this note. Finally the vendor of the shell was Timothy P. Halter. He was ground zero for literally dozens of disastrous Chinese reverse mergers as per this 2011 Reuters article. The entity actually reverse merged into China Biologic Products was called Logic Express, a British Virgin Islands Company. I do not know how Logic Express acquired Shandong Taibang. The deal happened on 19 July 2006. We know a little more about Logic Express now than when this deal happened because of the leak of the Panama Papers. Here is the link to Logic Express in the Panama Papers. Logic Express was registered on 6 Jan 2006, just over six months before it went public and originally had only two shareholders. These were Chan Siu Ling and Li Lin Ling. Three more shareholders signed up on 11 July 2006 - a mere 8 days before the company was listed. These shareholders were granted 18,484,715 worth about $1.8 billion dollars at current price. And remember what they owned was 83 percent of Shandong Taibang - founded only in 2002 and with registered capital of about USD10 million. The Panama Papers list only two shareholders of Logic Express from inception. They are Chan Siu Ling and Li Lin Ling. Who are they? Well let's get back to them later. SHANDONG, China--(BUSINESS WIRE)--July 20, 2006--Shandong Missile Biologic Products Co. Ltd. ("Shandong Biologic"), announced today the closing of a reverse merger transaction with GRC Holdings, Inc. (OTCPK:GRCG) ("GRC") and the closing of an equity placement by GRC and certain of its controlling stockholders raising $8.1 million in aggregate gross proceeds. Shandong Biologic is a biopharmaceutical company principally engaged in the research, production and manufacturing of human plasma-based pharmaceutical products in the People's Republic of China ("China"). GRC is a publicly-held, non-operating company with headquarters in Argyle, Texas that is in the process of changing its name to China Biologic Products, Inc. The reverse merger transaction involved a stock exchange with the stockholders of Logic Express Limited, a British Virgin Islands company ("Logic Express"), the 82.76% owner of Shandong Biologic. Upon closing of the exchange transaction , Logic Express became a wholly-owned subsidiary of GRC and the former shareholders of Logic Express acquired approximately 96% of GRC's issued and outstanding common stock immediately prior to the financing transaction described below. In connection with the change in ownership of GRC, Ms. Katherine Loh, Ms. Lin Ling Li and Ms. Siu Ling Chan were appointed to the Board of Directors of GRC, Mr. Michael Li was appointed as its Chief Executive Officer and Mr. Peter Yeung was appointed as its Chief Financial Officer. Immediately following the exchange transaction, a private placement of shares of common stock closed involving the issuance by GRC of 2,200,000 shares of its common stock at a purchase price of $1.895 per share and warrants to purchase 1,070,000 shares of common stock at an exercise price of $2.8425 per share. In addition, two of the controlling shareholders, Siu Ling Chan and Lin Ling Li (the "Selling Shareholders"), sold an aggregate of 2,080,000 shares of GRC common stock at a price of $1.895 per share to the investors including Pinnacle China Fund, L.P., who acted as lead investor in the private placement. Lane Capital Markets acted as exclusive placement agent and financial advisor and received warrants to purchase 214,000 shares of common stock at an exercise price of $2.8425 per share. As a result of the forgoing transactions, the investors collectively hold approximately 20% of GRC's issued and outstanding common stock immediately after the completion of the private placement but before the exercise of the warrants. Gross proceeds from the investors amounted to approximately $8.1 million. Part of the proceeds to GRC will be used to meet a $3.3 million capital contribution requirement that Logic Express has in Shandong Biologic. The proceeds being received by the Selling Shareholders will be placed into escrow until registration of the capital contribution with the PRC authorities is complete and, upon release, will be used primarily to repay indebtedness owed to Shandong Biologic. In the event such registration is not completed by July 31, 2006, the proceeds will be refunded to the investors and the shares purchased returned to the Selling Shareholders. As part of the private placement transaction, the Selling Shareholders have placed an aggregate of 4,280,000 shares of common stock into escrow. If the audited consolidated financial statements of GRC do not reflect at least $4,819,500 of after-tax net income or $5,823,465 of after-tax net income before minority interest for the fiscal year ending December 31, 2006, one-half of the escrow shares will be distributed on a pro rata basis to the investors. If the audited consolidated financial statements of GRC do not reflect at least $8,302,000 of after-tax net income or $10,031,416 of after-tax net income before minority interest for the fiscal year ending December 31, 2007, the second-half of the escrow shares will be distributed on a pro rata basis to the investors. If GRC has met the applicable threshold, the appropriate number of escrow shares shall be returned to the Selling Shareholders. GRC estimates the 2006 and 2007 revenues, on a consolidated basis, to be approximately $22 million and $36 million, respectively. 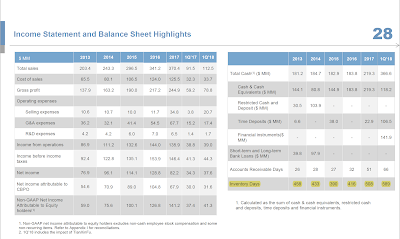 The Company emphasizes that the foregoing revenue estimates constitute forward-looking statements, and actual results may be materially different from those expressed herein. Again it is worth unpacking details here. The reverse merger target was in Argyle Texas. This isn't exactly a big place. The population is a couple of thousand. It is however where the above mentioned Timothy Halter has his ranch and many of his other reverse mergers hailed from. The company traded before (and after) this transaction on the Pink Sheets. Peter Yeung (who first turned up as a shareholder only 8 days before the reverse merger transaction) is the foundation Chief Financial Officer. But whoever Peter Yeung is he did not stay as Chief Financial Officer very long. The first 10-Q for China Biologic Products refers to Stanley Wong as Chief Financial Officer. I have tried to find out what happened to him. The best I have found is that he is Canadian educated and he handled the reverse merger as per this Bloomberg link. The Bloomberg link also states that Peter Yeung is also known as Wai Keung Yeung. An Albert Yeung (also sometimes Wai Keung Yeung) reappears on the board in 2012 as an independent shareholder even though the lineage appears to be as a director of the pre-reverse merger BVI company. The only named investor was Pinnacle China Fund. That is Barry Kitt's outfit. Mr Kitt is a controversial figure from the world of Chinese reverse mergers as this old Barrons piece shows. However in this case Mr Kitt's shares would be up a few hundred million dollars. Perhaps he is a great investor after all. The final thing is that the reverse merger agreement contained a collateralised guarantee that the published accounts will show at least a certain amount of profit - at least $10 million before minority interests. Remember that the capital base of Shandong Biologic was prior only about $10 million. These are big guarantees. But they were met. However the whole thing seems a little irrational. If China Biologic could really earn that much why were insiders selling their own shares to Barry Kitt's group? I couldn't explain it. China Biologic Products looked like a classic 2011 period Chinese reverse merger promotion. There are some of the same players as many of the entities that failed during that period. But there was one big difference. A deciding difference. And that was the business founded by Dr Du. I sounded out several people who knew Dr Du. One was a journalist who followed the story. One was a former official of the (Australian) Department of Foreign Affairs who had paid consular visits to Dr Du when he was an Australian in a Chinese prison. All of these people described Dr Du as legitimate and the business he operated as a real and valuable operation. This differed from some of the more egregious 2011 era Chinese reverse mergers because there was something there. We were short it in those days. And we covered. And thank the Dear Lord we did because the stock is up over 10x since we covered. It was always a possibility that some real Chinese companies chose to list into defunct pink-sheet shells and wind up being a fantastic business. And I guess this was that. The recommendations I got for Dr Du and his business were universally good. This may well be a truly good business that came to the market in an unusual way. Well to say China Biologic Products did well is to understate it. 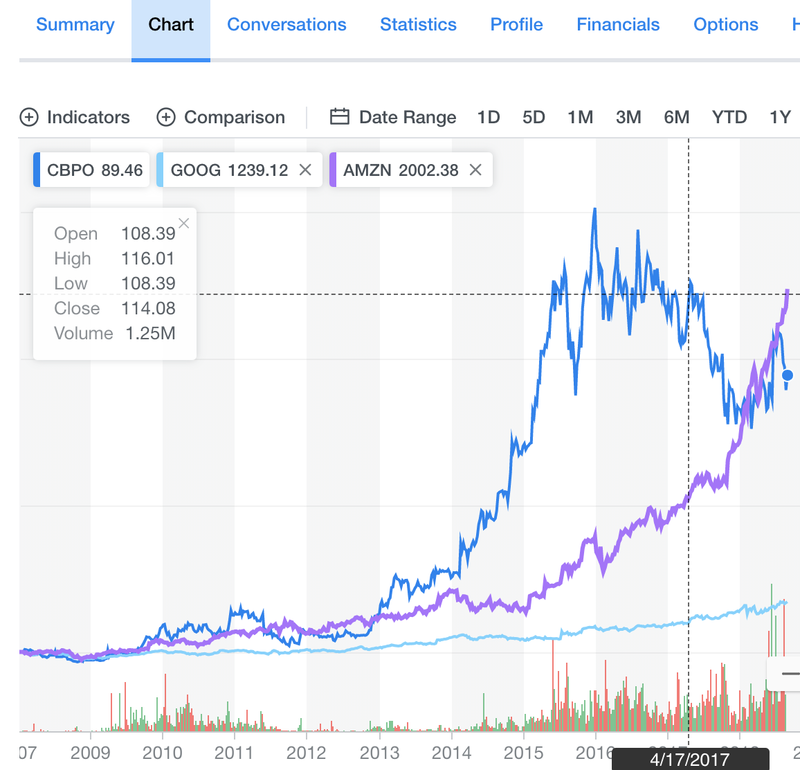 Here it is graphed against Google and Amazon as far back as Yahoo! has the data. Whatever: it is an astonishing performance. And it is a performance reflected in the accounts. They are frankly amazing. Here are the accounts downloaded from CapitalIQ. According to the accounts this has generated substantial net cash every year and capital expenditures have never exceeded $50 million. This company has grown like a weed and has never appeared to need external money. On the accounts this is an amazingly good business. The company did a few acquisitions to increase their footprint but in aggregate there were not many. The company generated plenty of cash - but it did not pay dividends or buy back stock. Indeed they issued stock. 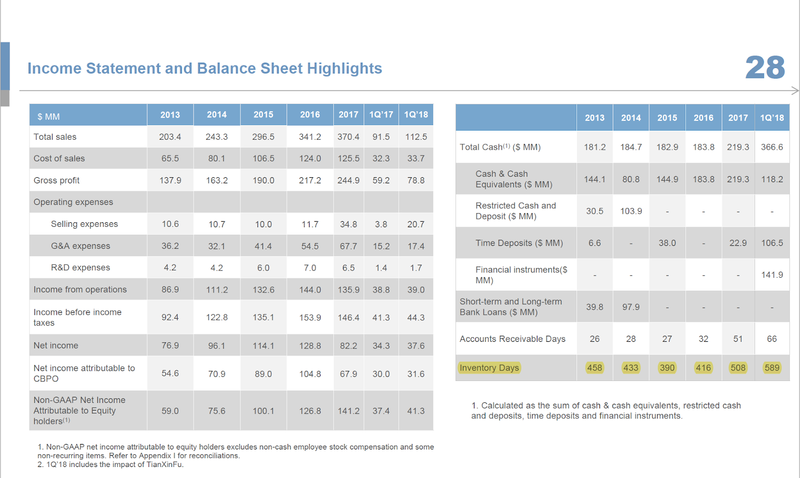 As of the last balance sheet they were sitting on $366 million in cash and securities mostly representing past profits. Remember very little cash was ever actually deployed in this business. Along the way there were repeated transactions with PW Medtech - a fairly illiquid Hong Kong listed company who seems to me to be functionally a related party. PW Medtech owns 5.5 million CBPO shares which is considerably more than its market cap. It has also - according to accounts and press releases received considerable cash. Marc Chan owns over a quarter of PW Medtech and 7 percent of CBPO. He may not technically be a controlling person - but he clearly has a large position. He never appears on any board though he is seemingly a Hong Kong resident operating through several BVI companies such as Parfield International. It is hard to find career details for executives of this company - but here are a few that I have puzzled over. The first 10-Q names Stanley Wong as CEO. You can find his LinkedIn page here. I have kept an archive of it here. The LinkedIn CVs states his role was "listing work". However he was there for ten months. He has been a director of a few companies that worked and a few that didn't. CapitalIQ for instance lists him as a former director of Blockchain Group (HK:0364). That didn't work. Tung Lam. Mr. Lam has been the Chief Executive Officer of our operating subsidiary, Shandong Taibang, since October 2003, and is responsible for the entire operation. Prior to joining the Company, Mr. Lam served, from November 1999 to August 2003, as the vice president of Fujian Province Fei Yue Group, where he was in charge of management investment. Ms. Siu Ling Chan is the wife of Mr. Tung Lam. You will remember her as one of the shareholders of Logic Express prior to its reverse merger. I am trying to establish if she is related to Marc Chan from PW Medtech - but have made no progress. The 10-K also gives a CV for Ms Chan. Siu Ling Chan. Ms. Chan has been our director since July 19, 2006. She has been our chairwoman since January 1, 2007 and served as our CEO from January 2007 to March 2007. Ms. Chan is also currently a director of our subsidiary Logic Express. She was also appointed as the director of Shandong Taibang in April 2006. Prior to joining us, Ms. Chan worked from 1991 to 2005, as an administrator at the Fujian Academy of Social Sciences, and from 1989 to 1991 as a statistician at the Fujian Pingtan Economy Committee. She received her diploma in Statistics from Xiamen University in 1989 and a diploma in management from the Fujian Party Committee School in 2004. The important detail is that she was educated at a Party School. These are finishing schools for elite Communist Party cadres. Allegations Regarding Identity of Tung Lam – With respect to the allegation that Mr. Tung Lam, the Chief Executive Officer of one of the Company's primary operating subsidiaries, Shandong Taibang, and spouse of Mrs. Siu Ling Chan, the Company's board chair, was previously known as Mr. Lin Ziping and was imprisoned for smuggling in China, the Special Committee found evidence supporting Mr. Lam's denial of the allegation, as well as conflicting evidence with respect to this claim. As a result, the Special Committee concluded that it could neither confirm nor exclude the allegation. Allegations Regarding Ze Qin Lin – With respect to the allegations that Mr. Ze Qin Lin, the husband of current CBPO director Ms. Lin Ling Li, is a former associate of Mr. Tung Lam and was imprisoned in China in connection with the same smuggling activities, the Special Committee found support for the allegation that Mr. Ze Qin Lin was sentenced to imprisonment in China in connection with smuggling offenses of Fuzhou Bonded Zone Western Industrial, Ltd. In fairness China Biologic also has other directors and officers whose CVs seem entirely appropriate. Many are hard to trace but that is probably my unfamiliarity with the Chinese sources. One of the interesting things about this company is how far and fast it has grown despite an extremely limited product set none of which are patent protected and all of which have extensive competition. There are only nine products sold in different dose forms as per this extract from the last annual report. We have a strong product portfolio covering over 20 different dosage forms of plasma products across nine categories, and one chemical drug, placenta polypeptide. All of our plasma products and the placenta polypeptide product are prescription medicines administered in the form of injections. Our principal products are human albumin and immunoglobulin for intravenous injection, or IVIG. Albumin has been used for almost 50 years to treat critically ill patients by assisting the maintenance of adequate blood volume and pressure. IVIG is used for certain disease prevention and treatment by enhancing specific immunity. These products use human plasma as their principal raw material. Sales of human albumin products represented approximately 35.8%%, 39.2% and 37.6% of our total sales for 2017, 2016 and 2015, respectively. Sales of IVIG products represented approximately 31.7%, 34.6% and 42.2% of our total sales for 2017, 2016 and 2015, respectively. Human albumin - their biggest product - is the most widely produced blood fraction in the world. Intravenous immunoglobulin (IVIg) is also very widely produced. The same can be said of all nine products - things like Rabies antibodies (which regular readers will know I have had). The last corporate presentation also makes clear that the company has a low market share - singled digit in most products. Here is the key slide. 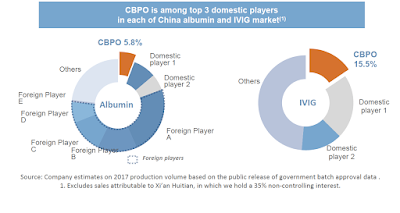 In human albumen, their biggest product, the market share is below 6 percent. I shorted this company in 2011 along with a bundle of Chinese reverse mergers. The aggregate trade was great - but this stock went up and I covered. I am not a sucker for endless pain. d) reams of related party transactions (especially if you regard PW Medtech as related). 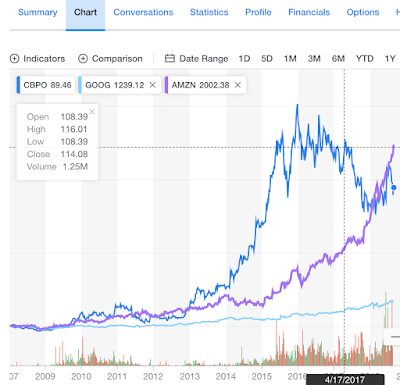 All of this makes for something that interests a short-seller but I wasn't going to put my neck on the line and short a stock that was performing like Amazon without stronger evidence and a catalyst. There was one anomaly in the accounts - one that I kept coming back to. This company seems to have too much inventory. This is particularly pronounced in the company's latest presentation. The presentation continuously points to supply shortages for plasma and blood products. For example take this slide which I have highlighted. Despite repeated comments by the company of shortages the inventory days are large and growing. This slide from the same presentation shows inventory days at 589. And it is not as if there is a complicated set of products which need to be held. There are only nine products and a range of doses. Again I have highlighted the key section. Blood products have large inventories. You need a store for emergency, and the time, for instance, for all the tests to come back also adds to the number of inventory days. The two biggest blood processing companies (CSL, Grifols) have between 230 and 260 days inventory. China Biologic has an extra year or it sitting around. 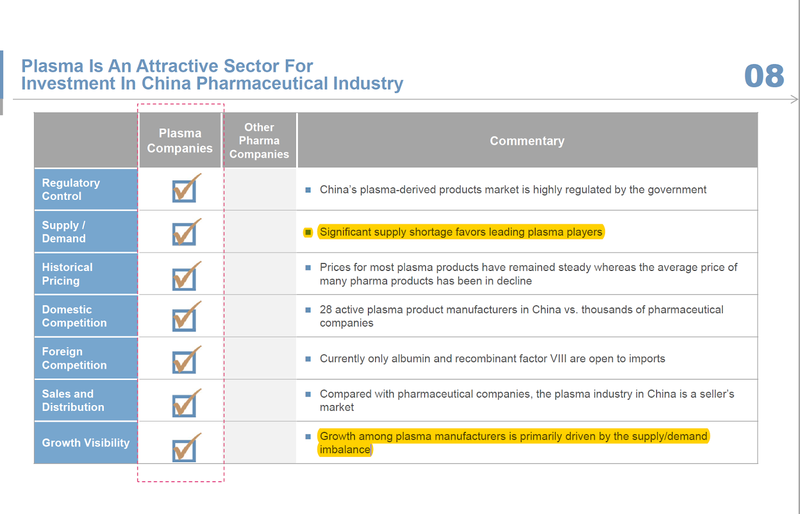 Some of the Chinese companies have more inventory than this - but none has close to China Biologic. I have identified private companies in the space too - and all have less inventory days than China Biologic. You can find our source list here. However we count CBPO has anomalously large inventory. I presume it is in fridges and well preserved or otherwise it would stink. Whatever. It is hard to reconcile all those excess inventory days with the repeated claims of shortages of product. Eventually the company received a go-private bid and an overbid. The first bid was from CITIC which is the government controlled Chinese private equity firm. CITIC is "Princeling Central" - the place where the children of the most powerful cadres wield their stuff. Here was the bid. Note that it is non-binding and subject to due diligence. The Board cautions the Company's shareholders and others considering trading in the Company's securities that the Board is reviewing and evaluating CITIC's proposal and no decisions have been made with respect to the Company's response to the proposal. There can be no assurance that any definitive offer will be made, that any agreement will be executed or that this or any other transaction will be approved or consummated. The Company does not undertake any obligation to provide any updates with respect to this or any other transaction, except as required under applicable law. So I am still completely unsure about China Biologic Products. It may be one of the greatest companies ever (as the accounts indicate) but I can’t dismiss the possibility that it is a residual Chinese reverse merger stock promote that did not fall apart around 2011. I know there is a business there - and probably a good business there - the one founded by Dr Du. But that this business has massively outperformed Google seems to me a stretch. (b) walk away, sell their stake (possibly aggressively) and I would make some coin. I genuinely had no idea of the outcome - but I thought the risk-reward was favourable so I put on the short. I got a little lucky. There was a vaccine scandal in China after I put the position on. One of the tainted products was rabies antibodies - a direct competitor to China Biologic. At a minimum fairly heavy regulation is coming. Xi commented extensively and was clearly angry. And when the Supremo is angry with blood products and vaccines a risk averse organisation like CITIC buying in seemed unlikely. I just did not think the deal would close. And for that matter nor did the market as the spread widened. BEIJING--(BUSINESS WIRE)-- A consortium composed of Mr. David (Xiaoying) Gao, GL Capital Group, Bank of China Group Investment Limited and CDH Investments (the “Consortium”) today announced it has made a non-binding proposal to acquire all of the outstanding common shares of China Biologic Products Holdings, Inc. (“China Biologic” or the “Company”) (NASDAQ: CBPO), that are not already held by the Consortium, for US$118.00 per share in an all-cash transaction valued at approximately US$3.9 billion. The proposal was conveyed on August 17, 2018 in a letter to China Biologic’s Board of Directors. The Consortium’s proposal represents an approximate 30% premium to China Biologic’s closing share price on August 16, 2018, and an approximate 40% premium to the Company’s closing price on June 8, 2018, the last trading day before CITIC Capital’s proposal to acquire the Company for US$110.00 per share was conveyed. The Consortium has received from Goldman Sachs (Asia) L.L.C. (“Goldman Sachs”) a non-binding letter indicating that, subject to the assumptions, terms and conditions in the letter and such other matters as Goldman Sachs considers relevant, Goldman Sachs is, as of the date of the letter, highly confident that as sole lead arranger, sole bookrunner and sole syndication agent, the structuring and syndication of a senior secured debt financing could be accomplished by Goldman Sachs as part of the financing for the acquisition described therein. Goldman Sachs is acting as financial advisor to the Consortium, Skadden, Arps, Slate, Meagher & Flom LLP is acting as its U.S. legal advisor, and Conyers, Dill & Pearman is acting as its Cayman Islands legal advisor. At this point I thought I was probably toast. David Gao is a former CEO of the company and so presumably knows what he is buying. His CV is plausible though it contains blemishes. The most notable blemish is that he was on the board of ChinaCast Education - a reverse merger stock that collapsed with admitted fraud. Moreover Goldman Sachs was highly confident that this could be financed. I simply couldn't see how I could win. But then I was puzzled because the vaccine scandal in China was growing. I could not see how the deal made sense with a wave of re-regulation coming at them. Whatever. I was let off the hook. China Biologic rejected both bids without due diligence and took money from a consortium to finance their future growth. Here is the press release. The release is a doozy. The company is rejecting the offer from the previous CEO. CITIC is withdrawing its offer and they are issuing 5.85 million shares to raise $590 million from a group of respectable investors. The big buyer is PW Medtech - and it is really hard to understand how they subscribe to this. PW Medtech has a market cap of USD320 million and it is buying over $300 million worth of stock. Their accounts show 90 million yuan of cash. That doesn't come close to paying for this. And - as observed - they and their controller - the difficult to track Marc Chan - are already massively overweight China Biologic. The other buyers are CITIC and Hillhoue. Hillhouse is only in for $80 million which to them is a drop-in-the-ocean. I know some senior people at Hillhouse. I had lunch with them once. But they haven't answered my emails. I am really keen to find out what they see in this company that I have missed. But at the end of this I am just perplexed. Yeah I am staying short. I don't see how all this works. But then again Dr Du did - by repute - found a pretty decent business so anything is possible. Dear readers I would love your thoughts. And if someone with a contrary view on the stock wants to contact me I am keen. Hillhouse presumably believes the extraordinary growth this company has had can continue. I would love to chat to them. Till then yours in puzzlement. Oh, and I remain short, but less short than when the takeover was in full swing.